KIWI Services offers commercial water damage restoration to all Ft. Worth businesses, so if your business has suffered water damage, look no further than KIWI to help with repairs. We offer quick and efficient commercial water damage restoration services to you and your business. KIWI specializes in bringing your business back to life after a bout of water damage. 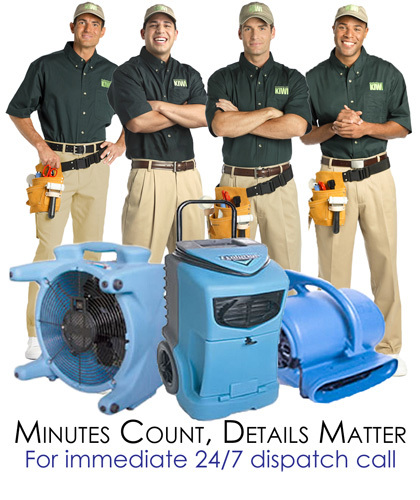 With 30 years of experience, KIWI is the most trusted commercial water damage restoration company in the area. We are IICRC certified, licensed and bonded, making us a reliable source for all work done. Our commercial water damage repair team is made up of Fort Worth’s finest technicians, leaving your business in the best hands. We also offer a one-year guarantee on all water damage work done as well as a one-year carpet cleaning warranty. KIWI wants to ensure all repairs are budget friendly, which is why we work with your insurance. It doesn’t matter the type of business or insurance you have, KIWI will be able to work for you. Give KIWI a call today to put your business back in working order after a bout of water damage. Our lines are open 24/7 and we can have a someone out there ASAP.